Later, after she’d departed for her train, I came across the cinema with Neil Young on the billboard. X is back home for a spell and I thought, where have got to be? I bought a ticket for the 11:30pm show. “Muddy Track” is a record of Neil’s 1986-7 European tour with Crazy Horse, at least half of which consists of his own personal home videos, shot on a classic 80s camcorder named Otto. 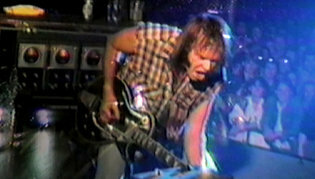 Young keeps the camera rolling during band rehearsals and fights on the tour bus, and on the stage he places it on his amp stack, facing out to film the audience, as he and the band deliver massive, feedback-distorted rock and roll to rioting audiences. The film is rough and raw and depicts a tour disintegrating into chaos. It’s always raining. The band can’t learn a new tune, and argues over vocal arrangements. Television interviewers pepper Young with questions about his relevance, one of which sparks the quote above, where he complains about electronic music. The whole time, he keeps trusty Otto by his side, rolling tape. Alone in his hotel room, he films himself eating breakfast and talks about the last show. Crowds roar as he pans the camera across the audience, hundreds of arms reaching out from the mass of bodies crushed against the stage. And the steady, droning buzz of pulsing rock throughout. I found myself watching with a smile as broad as the arc of the tour bus’s windshield wipers.